1. 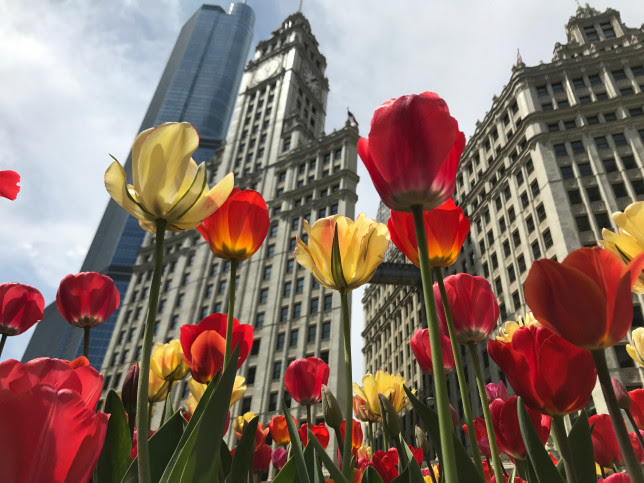 Stroll The Magnificent Mile (North Michigan Avenue between the Chicago River and Oak Street) and enjoy all the unique plantings. There is even a competition with awards for best plantings, so you know each property is on the top of their game. Take your family for a stroll and see which one is your favorite! 2. Go below the city by taking the elevator from The Shops at North Bridge (520 N. Michigan) down to the parking level and exit on Rush Street. Walk one block south and turn left. A cheeseburger, coffee or soda is an experience at the famous Billy Goat Tavern nestled below The Magnificent Mile. The experience is free, the food is not. 3. Visit the Tribune Tower (435 N. Michigan Avenue) and see the more than 150 fragments of stone embedded in the exterior of the building. Include pieces from the Taj Mahal, Berlin Wall, the Parthenon, Abraham Lincoln's tomb and more! 4. Go on an Urban Adventure Cruise and explore the views the city has to offer aboard Mercury, Chicago’s Skyline Cruiseline. Although not free for the whole family, kids under 5 are free and kids 5-15 are only $15. 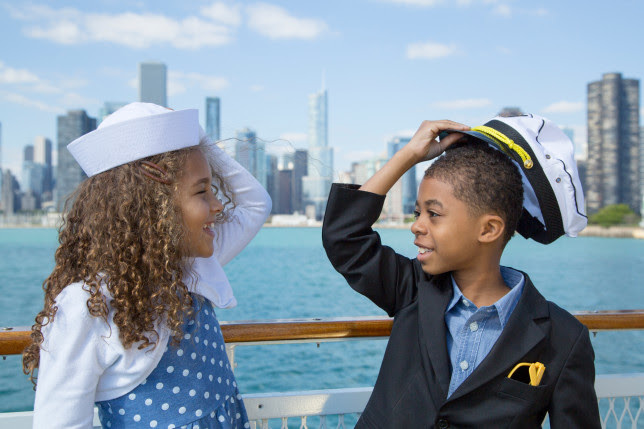 This cruise is sure to delight the entire family with amazing Chicago River and Lake Michigan views! 5. Venture south along Michigan Avenue - Cross the River on the Michigan Avenue Bridge but take a few moments to stop and enjoy the myriad of boats plying up and down the Chicago River just below your feet. Imagine 100 years ago, the Chicago River was the delivery port for merchandisers in our City. 6. Venture down to the Riverwalk and walk to the east (toward the Lake). The Riverwalk path will guide you all the way to Lake Michigan's front door. Follow it around to the right (south) to Monroe Street. Enjoy the people, dog and boat watching! 7. Stroll west along Monroe Street to see the Nichols Bridgeway connecting Chicago's famed Art Institute to Millennium Park. Stay to your right and enjoy all that Chicago's Millennium Park has to offer including the Cloud Gate - more popularly known as "The Bean" sculpture — offering plenty of family photo opportunities for the whole family. 8. 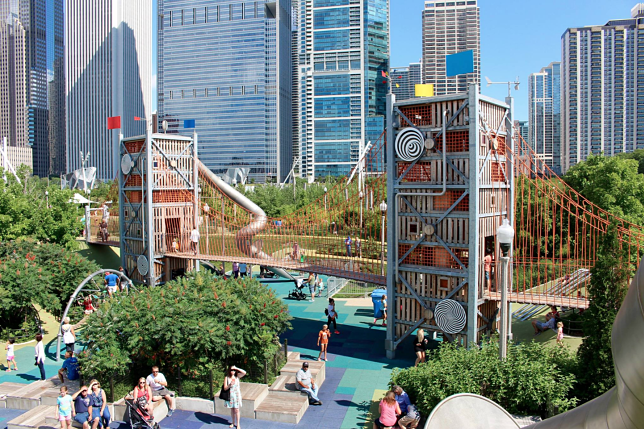 Finally, head east towards Maggie Daley Park for an afternoon picnic in the Picnic Groves. After you’re sufficiently refueled check out the 3-acre Play Garden. Your kids can discover different play features through a series of spaces like The Sea, The Watering Hole, The Harbor, The Enchanted Forest, Wave Lawn and Slide Crater. The Play Garden provides fun and adventure for children of all ages!